Tissue paper for my nest! Yesterday night when I was playing on the floor I found a bit of tissue paper on the floor. I put it all in my cheek pouch to use it in my nest. Papa saw me and he took me in his hand and gave me several pieces of stripped tissue. I took all of them to my nest. I have a very warm and comfy nest now! That's her favorite sweater, by the way. She likes it because she can grab the wool easily for climbing. Cheek pouches are so useful! At the pet store they have some really tiny hamsters, only about an inch long, and when their pouches are full they double in size. If only all animals carried purses built into their faces. Wow, Nana really is feeling so much better. That makes me so happy. Javi, you're adorable. And that you take such good care of your hammies makes you even more so. God bless you. Nana, glad to know you are feeling better and keeping the world safe from evil curtains! Keep fighting the good fight, whether it be suspect window coverings or that bump under your tail. Thanks for posting that pic of you and your Papa. A long-time reader and first-time poster. Nice picure, Javi!It would be nice to see Luna and Oscar in the little cuddle aswell! Awww Thats cute nana! Have a nice sleep! i know there sooooo cute! Hey Nana, Your Papa is a very handsome fellow, you are a lucky girl. Javi, Nana is huge. My Syrian hamsters are not even so big. How did you do that? You're really so good to Nana. I hope she's getting better day by day! Woot! Nana your Papa is very handsome for a non furry hamham. And you look pleased as punch with all that paper in your cheeks! So cute! That's one huge hamster! Your so good at taking care of your hamsters. I hope Nana gets well soon. is getting better! Take care! You have white hair like Nana. Nana has more. aww.. nana, hope your bump gets better! btw, you are absolutely precious! javi, you look a bit like david copperfield in that photo :) as if you've just pulled a hamster from out of thin air.. lol.. Someone else's trash can be your cozy bed sweetie. Yay! My wish for Nana: As your cheeks get bigger, may your bump get smaller! Your handsome Papa loves you very much! Those are some puffy cheeks! I am glad Nana is feeling better. I hope she's okay. Wow! 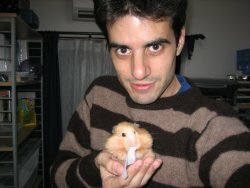 Adorable human and hammy! What makes you all the more prosh is your love for those little guys! Kudo's! Don't keep us in too much suspense. Even all the way from the eastern coast of the United States we are wondering how Nana is. Hope all finds you well. Nana, are those the evil cutains in the background of this picture and the one before? Nana, my hammies would love to communicate with you; you can e-mail them at Dani@homecage.net, and Nimble@homecage.net. They look forward to hearing from you, and their Mama would love to hear from your human! He can e-mail me at chaynes@homecage.net. I would like to talk to him about his webpage, and get permission to link to it! Hope to hear from you soon! BEF vs. SBrEF. Depends on who you ask!